Headed towards the beach? Stay in the heart of the action at the Holiday Inn-At the Pier, ideally located at the entrance to the Santa Monica Pier, within easy walking distance to the 3rd Street Promenade Shopping District and near the Santa Monica Civic Centre. The hotel is ideal for leisure travellers with its wide array of recreational amenities including a fitness centre, entertainment facilities, and outdoor pool, and the new remodeled rooms provide a relaxing retreat from the excitement of the area. 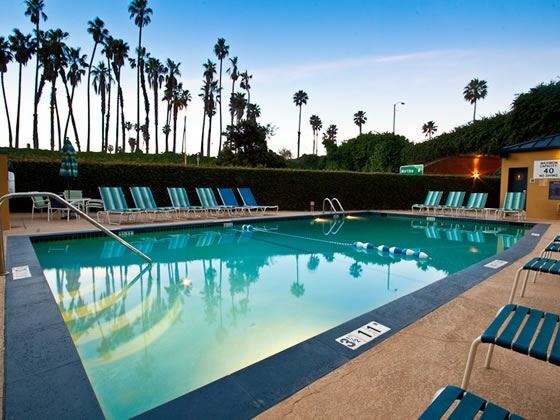 Located within waking distance of Venice Beach and Santa Monica Pier. 132 Guest Rooms on 7 floors. Enjoy a great night’s sleep in newly remodeled guest rooms featuring 32" flat-screen televisions, in-room safes, stylish furniture, pillow-top mattresses, comfortable bedding, large desk, chair, and lamp. Bathrooms have a sizable vanity, expanded shower, and Garden Botanika amenities. Complimentary exercise room - 4 cardiovascular machines-treadmills, exercise bike and a strider. Moments from Santa Monica Beach, the Fairmont Miramar Hotel & Bungalows offers understated luxury, attentive service and a perfect location within easy reach of the sights and attractions. Steps from the beach in the heart of vibrant Santa Monica, Oceana is a friendly haven of color, comfort and opulence. A Santa Monica beach hotel offering luxury amenities and fine dining. A modern take on the classic beach hotel, the Sheraton Delfina Santa Monica provides a stylish and unique setting that’s perfect for a fun-filled Southern California holiday or relaxing beach getaway.